For a community to have a clean and dependable water supply, it must build and maintain high-quality drinking water and wastewater infrastructure. While some modernization has been achieved, there is still much work to be accomplished. The trench and excavation work required to support these infrastructure projects represents some of the most dangerous jobs in the construction industry. The work often takes place in congested areas, on public roads, and building sites. A cubic yard of soil weighs as much as a car, so a trench collapse can kill in minutes. According to the Bureau of Labor Statistics, excavation and trench-related fatalities in 2016 were nearly double the average of the previous five years. The Occupational Safety and Health Administration (OSHA) has made a reduction in trenching and excavation hazards its Priority Goal. Complying with OSHA’s trench safety standards and maintaining constant awareness of the hazards associated with trench work can prevent deaths and injuries. Safety improvements lead to other jobsite gains, as well. As a Dodge Data & Analytics Report noted, contractors experience critical benefits from their safety investments. These benefits include positive impacts on budget, schedule, and quality. So, establishing a safety culture not only keeps employees safe; it also leads to improved project productivity. OSHA stipulates safety standards for protecting workers from cave-ins, which the agency cites as posing the greatest risk. Cave-ins are much more likely to result in worker fatalities than are other excavation-related accidents. Because trench construction involves multifaceted situations, these standards address requirements for sloping, benching, shielding, and shoring, in addition to soils analysis and guidelines for installing and removing protective systems. Managers and workers should learn these standards and review them regularly. On an enterprise level, organizations need a comprehensive policy that details safe trench and excavation practices. The policy process should accommodate suitable planning and supervision, compel recurrent inspections of excavation sites to detect any change in soil conditions, and confirm adequate support for trenches. A sound policy will systematically detail responsibilities and standardize safe practices for employees. The competent person is the one person most responsible for employee safety. Compliance with OSHA standards requires the designation of a competent person to inspect trenches and identify potential hazards. Inspections must cover every aspect of excavation, safety, and shoring equipment, and address soil type, work in adjacent areas, the possibility of vibrations, and weather conditions. As part of the pre-work hazard inspection, the competent person confirms that workers have proper protective equipment. Additionally, according to OSHA, competency means the individual is capable of identifying existing and predictable hazards or working conditions that are hazardous, unsanitary, or dangerous to employees. The competent person has authorization to take prompt corrective measures to eliminate or control these hazards and conditions. 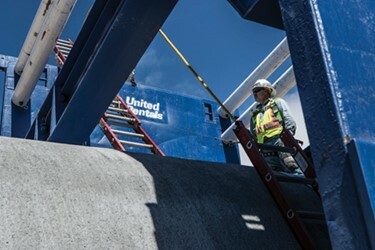 Protective equipment to improve productivity and worker safety has become significantly better with advancements in both manufactured systems using tabulated data and site-specific engineered solutions using shields, shoring, bracing, and high-arch clearance spreaders. Lighter-duty shields with high-arch clearance, cut-outs and guide frames, and larger-capacity hydraulic bracing give contractors more options to manage the quality, production, and safety of their projects. It’s vital for contractors who work in underground operations to consider every safety resource available to workers — classroom training, pre-bid analysis on protective system solutions, on-site consultation, and engineering designs. As drinking water and wastewater treatment projects become more complex, safety in excavations and trenches requires an effective training program that is adopted by employees at every level. It also entails partnerships to assist when safety decisions are beyond a contractor’s typical scope of performance or experience. With the right programs in place, organizations can create a safety culture that not only provides safe workplaces, but also enables workers to be productive in delivering quality results on schedule and budget.